What is it about a government coup that Republicans don’t understand? It is the way a dictator gets to get the last word, as he attaches himself like a tick into the hide of a nation. We are drowning in the triumphant philistinism of Donald Trump, a detestable populist demagogue who reassures his Republican cult with the words “I love the uneducated” while he brands 5,000 immiserated refugees who have walked over 1,000 miles to beg for asylum at our border as gang members and terrorists. His words are the précis of the 20th Century text written by Stalin, Hitler and Mussolini. Tyrannical leaders must create enemies to mobilize the hate and fear they need to assume the reins of government power. And Republican voters heedlessly cheer Trump’s immigration layup shot. Their votes allow him to mobilize US military forces against unarmed “enemies of the state” to fight a fictitious threat to national security. Their votes allow him to announce that the anti-Semitic chants of white supremacists are merely the earnest expressions of impassioned citizens desiring nothing but to be heard. Not one of his followers asks which is a greater threat to our 242-year-old democracy: 5,000 poverty-stricken refugees begging for salvation – or 14 pipe bombs intended to wipe out the top leaders of the only party that stands in opposition to Trump. Not one asks which is a greater threat to our democracy: Lincoln’s description of America as, “…a new nation, conceived in liberty, and dedicated to the proposition that all men are created equal” – or Trump’s speeches denouncing the free press by invoking the Nazi terminology of “Lügenpresse” (Lying Press), his America First sloganeering, invoking the fascist terminology of “Blut und Boden” (Blood and Soil), or assaulting our ears with the White Nationalist chants of “Jews will not replace us”, invoking the anti-Semitic Nazi terminology of “Blutschande” (blood disgrace). And now, under Donald Trump, we have built internment camps to imprison these Central American refugees for undisclosed periods of time in undeclared sites throughout the US. 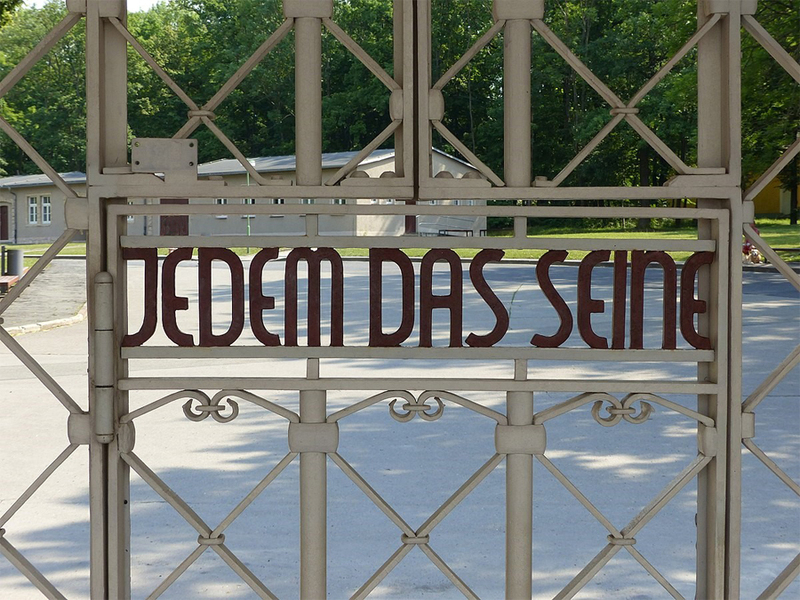 “Jedem das Seine”: The Nazi moral condemnation of Jews on the gates of Buchenwald. “To Each What He Deserves”. We are poised to become the new America that Trump and the Republican Party have jointly woven out of their own whole cloth to echo the fascist rhetoric of 20th Century Europe – a country of theft, greed, indifference to the suffering of others, and soulless cruelty. We are poised to become what Donald Trump was raised to be by his own father – by a father who made his millions defrauding and stealing from the US government; by a father who willfully violated the civil rights of minorities; by a father who marched in racist demonstrations exactly like that of Charlottesville; by a father whose photograph sits in a gilded frame over his shoulder at the Resolute Desk in the Oval Office. Steve Schmidt, former Republican strategist, recently said that Trump’s “…only affinity for reading anything were the Adolf Hitler speeches he kept on his nightstand”, referring to Hitler’s book of his own speeches entitled, “My New Order”. Trump is nothing if not a chip off the old block, and the Republican Party is, in Churchill’s words, furiously “…feeding the crocodile in the hopes that it will eat them last”.